The Tech Report snapped pictures of three MSI X79 mainboards at the IDF in San Francisco, you can view them at this link. Gigabyte and Intel aren't the only ones showing off X79 motherboards at IDF. 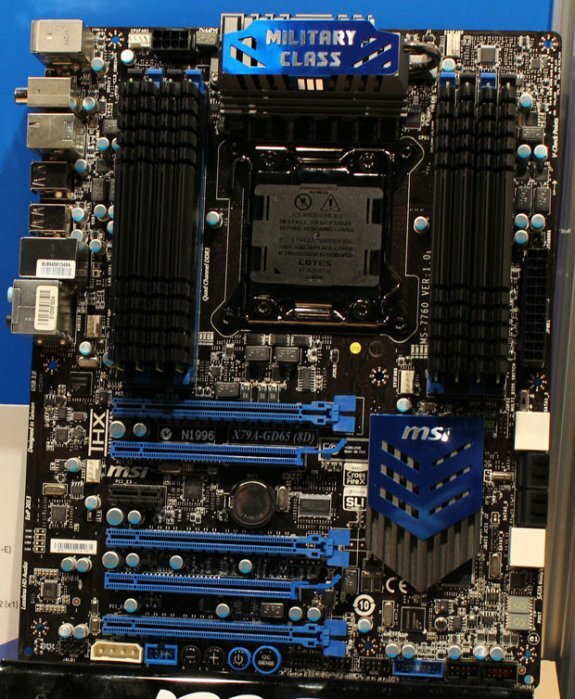 MSI has three LGA2011 boards on display, including a pair of models with five PCI Express x16 slots. One of those is the X79A-GD80, which is pictured below. Yep, another black-and-blue enthusiast motherboard. This one has eight DIMM slots with support for up to 64GB of DDR3 memory at 2400MHz. The eight Serial ATA ports are split evenly between 6Gbps and 3Gbps connectivity, and MSI has whipped up what it claims is a much improved graphical interface for the board's UEFI.